This article is about the television network in Japan. For other uses, see Asahi. TV Asahi Corporation (株式会社テレビ朝日, Kabushiki-gaisha Terebi Asahi), also known as EX and Tele-Asa (テレ朝, Tere Asa), is a Japanese television network with its headquarters in Roppongi, Minato, Tokyo, Japan. The company also owns All-Nippon News Network. In 2003, the company headquarters moved to a new building designed by Fumihiko Maki. The address is: 6-9-1 Roppongi, Minato, Tokyo, Japan. Some of TV Asahi's departments and subsidiaries such as TV Asahi Productions and Take Systems are still located at TV Asahi Center, which is TV Asahi's former headquarters between 1986 and 2003. It is located at Ark Hills, not far from its headquarters. TV Asahi began as "Nihon Educational Television Co., Ltd." (NET) (株式会社日本教育テレビ, Kabushiki-gaisha Nihon Kyōiku Terebi, "The Japanese Educational Television Company") on November 1, 1957. It was established as a for-profit educational television channel. At the time, its broadcasting license dictates that the network is required to devote at least 50% of its airtime to educational programming, and at least 30% of its airtime to children's educational programming. The station was owned by Asahi Shimbun, Toei Company, Nihon Keizai Shimbun, and Obunsha. However, the for-profit educational television model eventually proved to be a failure. In 1960, NET began its transformation into a general-purpose television station. It began to broadcast anime and foreign movies. So as not to run afoul of the educational TV license requirements, NET justified the airing of these programs under the pretext of "nurturing a child's emotional range" (子供の情操教育のため, Kodomo no jōsō kyōiku no tame) and "introduction of foreign cultures" (外国文化の紹介, Gaikoku bunka no shōkai). At the same time, NET also changed its common name from "Nihon Educational Television" to "NET TV" (NETテレビ). Seven years later, in 1967, NET aired its first colour broadcast programme. Part of its transformation into a general TV channel would be the April 1971 premiere of the Kamen Rider Series by the Toei Company and creator Shotaro Ishinomori, the tokusatsu superhero series that would make the channel a national hit. It has been its home ever since, joined by yet another toku series, Super Sentai, in the spring of 1975 (KR left the channel in 1975, only to return in 2000). Aside from these two live action programs, which would become part of its flagship programming, due in part by the work done by Toei's animation branch, the 70s were also marked on NET with great animation classics of national fame, which aired one after the other in the channel and were even exported to other countries, many of these would be part of daily life and culture and helped introduce the world to the anime genre. Such animations put the channel in direct competition with other stations which broadcast similar programming. NET's transformation into a general-purpose television station was complete by November 1973, when NET, along with educational channel "Tokyo Channel 12" (now TV Tokyo) in Tokyo applied and received a general purpose television station license. At the same time, NET renamed itself as NET General Television (総合局NET), which subsequently became the "Asahi National Broadcasting Company, Limited" (全国朝日放送株式会社, Zenkoku Asahi Hōsō Kabushiki-gaisha, commonly named "TV Asahi") on April 1, 1977. Five years later, TV Asahi became the official network, until 1999, for yet another Toei live action franchise, the Metal Hero Series. In 1996, TV Asahi established the All-Nippon News Network (ANN) (オールニッポンニュース・ネットワーク, Ōru Nippon Nyūsu Nettowāku), and began a number of reforms, including the unification of all presentation styles on its regional networks and the creation of a new logo to give Asahi the look and feel of a national television network. 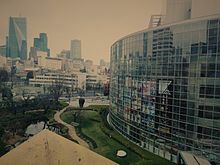 On October 1, 2003, TV Asahi moved its head office from its Ark Hills Studio to Roppongi Hills, and the station was renamed "TV Asahi Corporation", with the name presented as "tv asahi" on-screen. The transmission of international aquatics competitions, World Cup football matches, and creation of popular late-night TV programs contributed to a rise in ratings for TV Asahi, and lifted the TV station from its popularly ridiculed "perpetual fourth place" finish into second place, right behind Fuji TV, by 2005. The station also launched its own mascot, Gō EX Panda (ゴーエクスパンダ, Gō Ekkusu Panda), also known as Gō-chan (ゴーちゃん。) Gō-chan is currently seen on TV Asahi's opening sign-on ID. TV Asahi's current branding were created by UK design collective Tomato (some members work as the electronic music group Underworld) along with TV Asahi's in-house design department in 2003. It comprises a set of computer-generated "sticks" in white background, which changes in colour and movement along with the background music that accompanies the idents. TV Asahi also uses a brief eyecatch of its sticks animation at the top-left of the screen after commercial breaks. The background music used for TV Asahi's sign-on and sign-off videos are Underworld's Born Slippy .NUXX 2003 and Rez. TV Asahi later updated its sign-on and sign-off video in 2008 with a revised version of computer-generated "sticks" animation and new background music. TV Asahi's slogan New Air, On Air appears at the top of its name. It can be seen on TV Asahi's YouTube channel, which in 2011-12, was replaced by its mascot, Go-Chan. The company writes its name in lower-case letters, tv asahi, in its logo and public-image materials. Normally, the station branding on-screen appears as either "/tv asahi" or "tv asahi\". The station's watermark appearance is the stick at the top with the station's name at the bottom. The fonts used by TV Asahi for the written parts are Akzidenz Grotesk Bold (English) and Hiragino Kaku Gothic W8 (Japanese). Since 2004, the funding of this station is through sponsorship.